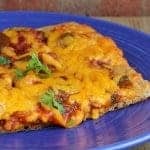 A fun twist on the traditional sandwich, this Manwich Pizza will have the whole family smiling. If you’ve been a reader of Rachel Cooks for any time now, you’ll know that I’m a huge fan of quick and easy dinners. And lunches, and breakfasts. And desserts. I also love things that you can transform into a number of different meals so dinner time never gets boring. That’s how I knew to say yes when Manwich asked me to partner with them on this project. Because Manwich doesn’t just have to be sandwiches. Although those are always fantastic, especially when feeding a crowd and kids. Manwich has “kid stopping power.” Kids are like a whirlwind…never stopping…sometimes not even to eat. Manwich loves that problem, and the kids will love the fun bibs included in this giveaway. I made this cheesy pizza using ground turkey, Manwich, some veggies and a great whole wheat crust. Everyone in my family loved it. I can think of a thousand other uses for Manwich. Tacos, chilis, pastas! Enchiladas? I’m getting hungry just thinking about all of the options. If you’re still craving more ideas, check out Manwich Recipes on their website. 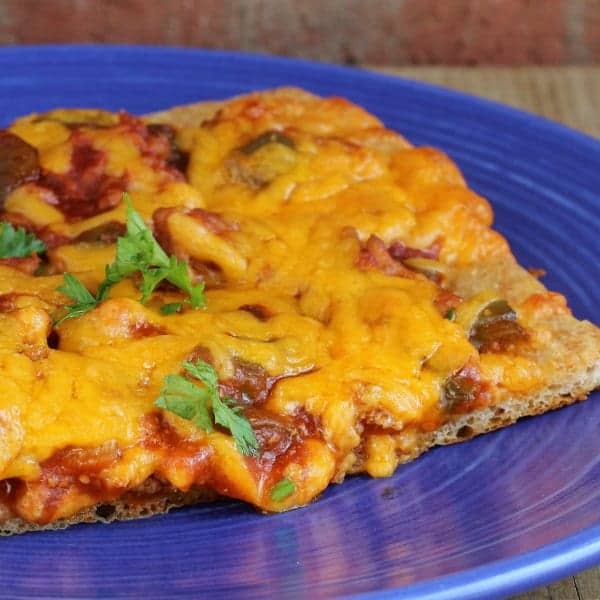 This Manwich pizza is a fun and healthy alternative to the traditional sloppy sandwich. Your whole family will love it! In a large frying pan or saucepan over medium high heat, heat oil. Saute green bell pepper, onion, and turkey in oil, breaking up turkey, until turkey is cooked through and vegetables are softened. Verdict: The whole family loved this fun pizza. Great left over too. Want more Manwich? Watch their fun Manwich TV Ads on their website. I really want to try the Sloppy Joe Dip! Looks delicious and I know my family would also enjoy it. I want to try the Sloppy Joe Slider Pull Aparts; they look perfect for parties. Party Sausage Dip! Sounds perfect for upcoming tailgating season!! I would like to try the slow cooker pulled chicken sandwiches recipe. The Saucy Baked Chicken looks interesting and different! The Slow Cooker Pulled Chicken Sandwiches. The Sloppy Joe Cornbread Bake looks amazing! 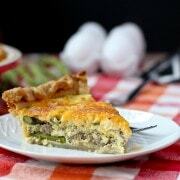 I love tamale pie, so I’m sure that would be amazing!! I’d like to try the creamy sloppy joe recipe. I want to try the sloppy joe slider pull aparts. Who wouldn’t!? My son loves tacos so I would have to pick the Sloppy Joe Tacos. The Hero Joe recipe looks delicious! I like the sound of the shredded beef manwich on a bun! The Sweet and Savory Saucy Meatballs look yummy! Sloppy Joe Cornbread Bake for me! The turkey sloppy joe cornbread bake looks amazing! Grands Unsloppy Joes. My kids love Sloppy Joes…I just hate the “sloppy”! Wow, I never thought there were so man options to try. The Meatball Hoagies look amazing! I love meatballs and I love manwich! So great combination. Never thought to use Manwich as other dishes. Good inspiration! The sloppy joe tacos sound different and delicious, I’m always looking for new ways to do tacos! The saucy meatloaf looks good. My family loves meatloaf in all shapes, styles, and recipes. I am going to make grands unsloppy janes for dinner tonight.thanks for the great recipes. The Grands Unsloppy Joes look wonderful! What a great idea! Fun! The Creamy Sloppy Joe Bites would be my pick. What a fantastic giveaway. Oh my…all of the recipe look yummy! There’s no way I can pick just one favorite. Cant’ wait to try them all. The Meatball Hoagies would be my kids favorites, they love meatballs. My hubby and I would enjoy the Shredded Beef Sandwiches for sure. And the Sloppy Joe’s Turkey Tacos are just winners! The turkey sloppy joe corn bake sounds great! I want to make those Sloppy Joe Sliders for football season! I’ve got the Turkey Sloppy Joe Cornbread Bake marked to try. 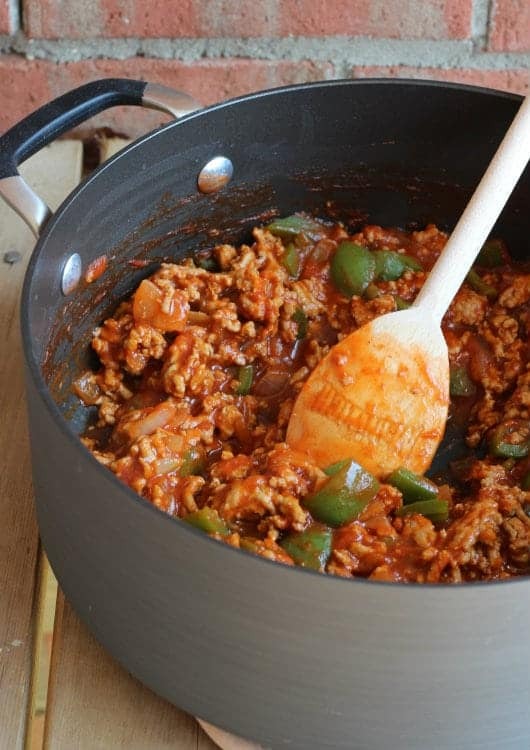 Sloppy Joes and cornbread, together in one pan–what’s not to like? Oh, the Meatball Hoagies look best to me–I used to love meatball sandwiches. Sloppy Joe tacos would make my boyfriend swoon! 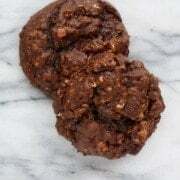 I want to try Grands!® Unsloppy Janes. They look portable and tasty. the Saucy Wings looked yummy! This is brilliant!! 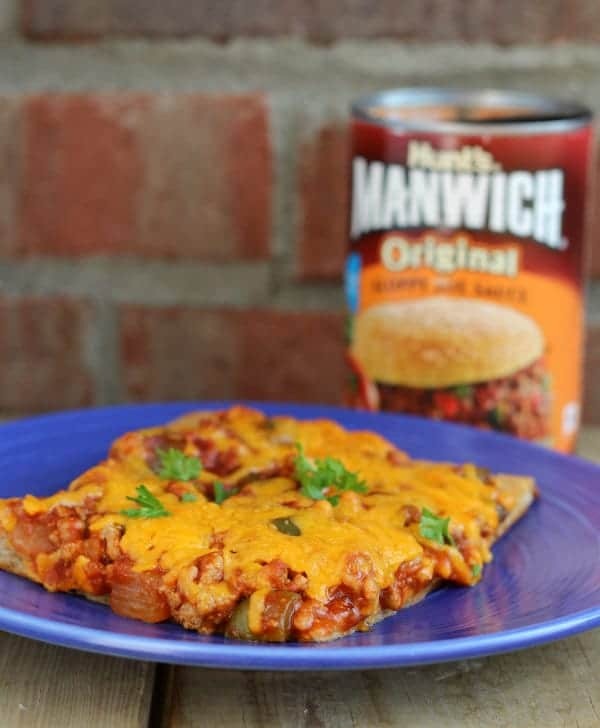 I grew up on Manwich and I love those flavors! Sloppy Joe Tacos and the Sloppy Joe Dip are the first two I would love to make. Doesn’t auto correct make for interesting comments? My family would definitely love the Sloppy Joe Slider Pull Aparts. Who can resist Hawaiian Rolls?!! How fun – what a great idea for a pizza! I agree – the sloppy joe slider pull aparts sounds great! The Hero Joe’s look great – I never thought of using Manwich on anything but ground beef/turkey! The Sloppy Joe Slider Pull Aparts look like the perfect game day food! Turkey Sloppy Joe corn bake sounds delicious and my family will love it. My family sure likes the traditional Sloppy Joe. The Sloppy Joe Biscuit Casserole looks scrumptious! 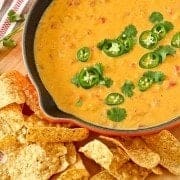 The party sausage dip looks so good. I would try the saucy meatloaf. Definitely the Turkey Sloppy Joe Cornbread Bake! The Turkey Sloppy Joe Cornbread Bake sounds good! The Slow Cooker Pulled Chicken Sandwiches look yummy! The sweet and savory saucy meatballs sound amazing! The Sweet and Savory Saucy Meatballs look so yummy! I love meatballs. I think I would like to make both the sliders and calzones, they fit in a kids hand and can be made ahead for the immediate solution to “I’m starving”. The Sweet and Savory Saucy Meatballs look really good. I will be trying the no alarm chili. It looks fast and tasty. the chuckwagon beef and bean dinner looks good. Turkey Sloppy Joe Cornbread Bake looks absolutely delicious as well as your pizza. I may have to make both. The Saucy Meatloaf looks amazing–so simple, but…wow! Your pizza looks so good, too.